This was my self-assigned homework ahead of going on this holiday to the Czech Republic with the Dracula Society in May / June. 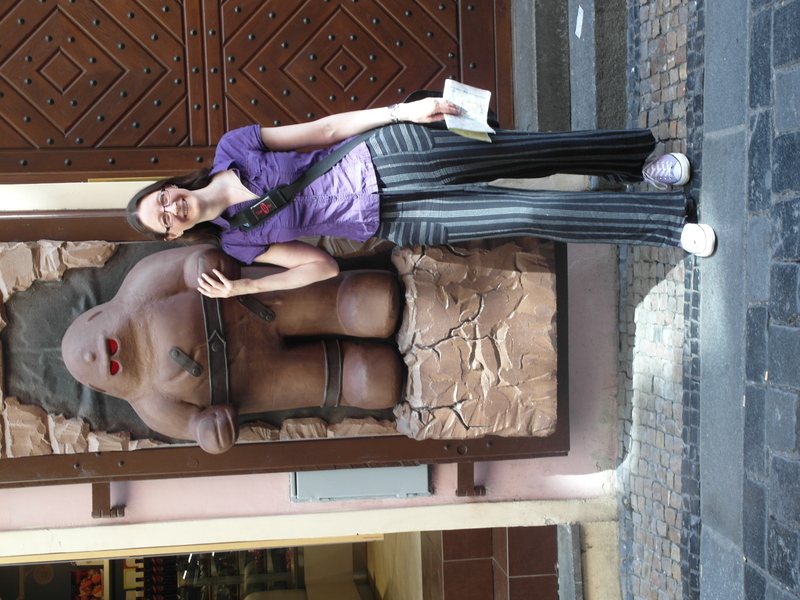 The holiday was themed around the legend of the Golem of Prague, but as I had only a passing acquaintance with golems of any kind before I booked my place, I decided to do something about that for the sake of enriching my holiday. I started with the Wikipedia page on golems, from which I learnt that the idea of the golem is rooted in the Bible, and receives occasional mentions in both ancient and medieval Jewish literature, but really came into its own in the early modern period. What seems to have happened is that stories grew up in the 17th century about how a real historical Rabbi from the 16th century had made a golem in order to protect the Jewish community of the town of Chelm in Poland. 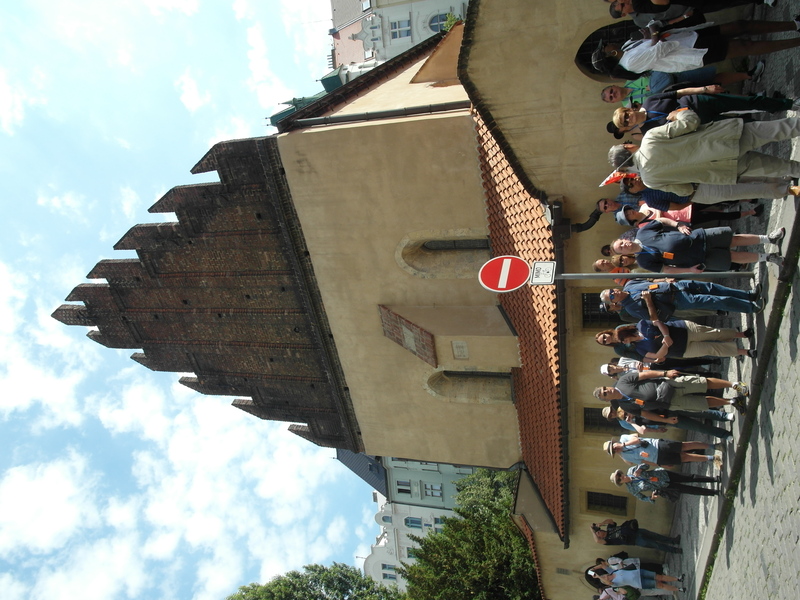 But by the mid-19th century, those stories had shifted location to Prague and attached themselves instead to Rabbi Judah Loew, a different real historical person from the 16th century who was a major public figure and prolific scholar. 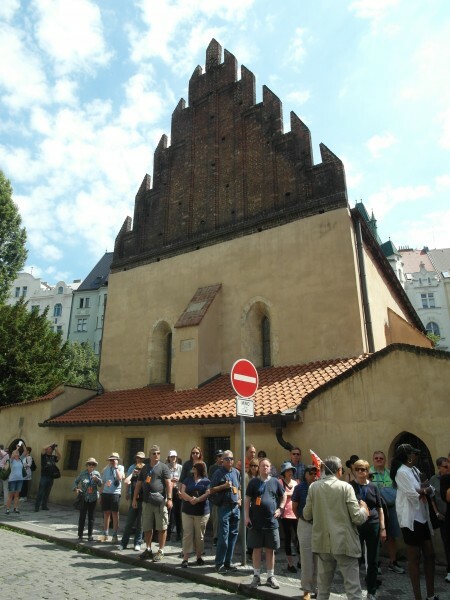 So the Prague legends as we have them now actually consist of the 17th-century Chelm stories, retrojected by 19th-century authors into 16th-century Prague. That understood, I was ready to hit the library. I wasn't about to take on German-language novels for my leisure reading, but as it happened that didn't really matter, because the only relevant material was held in the form of English translations anyway. I started out with two fairly traditional tellings of the Prague legends, one in print and one on film, and then moved forwards to more modernist authors playing around with and developing the mythos. As it happens, one of the modernist tellings (Meyrink's novel from 1914) was actually published before the more traditional one I read (Bloch's from 1917), but that is largely because Bloch sought to reassert the traditional form of the stories, as they already been circulating in the mid-19th century, in reponse to Meyrink's modernism. So it made sense to read Bloch first, even though he postdates Meyrink, in order to understand (if indirectly) the sort of material which Meyrink had been building on. 9. Chayim Bloch (1917), The Golem: Legends of the Ghetto of Prague (translated from the original German by H. Schneiderman, 1925). As the introduction to this book explains, Chayim Bloch was a Rabbi who wrote Der Golem during the First World War while serving as a chaplain in an Austro-Hungarian prisoner of war camp. It draws heavily on an earlier wave of 19th century publications of the golem legends of Prague, which weren't available to me, and in doing so served my purpose of becoming acquainted with the straightforward versions of the story before moving to later embellishments. In fine Gothic tradition, it also presents itself as a 'found text' rather than a work of fiction – that is, Bloch claims to be presenting the contents of an old manuscript, rather than writing the legends himself, and deliberately tells them in a very simple style to lend verisimilitude to the claim. Yet that simple style also meant that other tropes of Gothic literature were missing - in particular, anything much in the way of drama and atmosphere around the magical and / or terrible happenings related. I was expecting at the very least a violent storm and descriptions of anguish and fear as the golem was created, but far from it. Rather, everything was related in an incredibly matter-of-fact manner, including not only the creation of the golem itself, but also the fact that the Rabbi just has an amulet which can make the golem invisible and can make magical banquets appear out of thin air. But this does of course suit what Bloch was trying to do – present tales as though told by simple early-modern people convinced of the reality of magic, about things which had actually happened. The story is also told episodically, in the sense that although it does move broadly chronlogically through Rabbi Loew's life, and the creation, activities and eventual destruction of the golem, it isn't knitted together into a single, smooth unfolding narrative. Rather, each episode stands alone, introduced by phrases such as "One day, Rabbi Loew heard…", and many of them also relate very similar events. Again, this helps to dispel any sense of artifice – the stories come across as multiple testimonies based on a smaller number of real events. Most later portrayals of golems show or describe them as identifiably made out of animated clay, but Bloch is very clear that, once animated, his golem looks and acts like any other man, with the one exception that he cannot talk. In fact, Bloch's golem essentially becomes just another of the Rabbi's servants, although he is unusually obedient and hard-working. The Rabbi's main motivation in creating him is to protect the Jewish community in Prague from Christian accusations of blood libel, and a lot of what the golem does on this front is detective work. Equipped with the amulet of invisibility, he discovers what has actually happened to children whom the Jewish community have been accused of murdering, allowing Rabbi Loew to pass this information on to the authorities and save the Jews from being persecuted for it. The famous propensity of golems to take instructions literally and continue mindlessly on the same task if they aren’t explicitly told to stop is in here, but with religious overtones – it only becomes a problem when the Rabbi's wife asks the golem to perform an ordinary household chore (collecting water), as opposed to God's work of protecting the community. Similarly, the golem becomes violent on a couple of occasions when blocked in its purpose, but this isn't built into a Frankensteinish morality tale about the dangers of trying to create life or perform magic. Instead, it seems to be just a minor flaw arising from the golems dogged sense of purpose, which the Rabbi manages to control. In fact, in the end, the collection isn't really centred around the golem at all, who becomes little more than another (mute) assistant for the Rabbi. Rather, it is about the cleverness of the Rabbi in protecting his community and interceding with authority figures on their behalf. In the end, the Rabbi decides to decommission the golem not because it has become dangerous, or because he has come to regret creating it, but simply because his own general vigilance on behalf of his community has put a stop to the blood libel accusations, so the golem isn't needed any more. Meanwhile, of course, beneath the historical-fantastical cloaking, the contents and preoccupations of the stories reveal a great deal about the anxieties of European Jews in the early twentieth century. It's impossible to read or watch any of the golem stories from this period without being horrifyingly aware of how right they were to be anxious. Indeed, I think Bloch was in part actively trying to counter anti-semitic prejudice through writing this book, as I'm fairly sure there was something in the introductory material about wanting to make non-Jews aware of the history and persistence of blood libel accusations – though I can't check now, as I have already taken it back to the library. Would that it had worked. This is a classic of silent expressionist cinema, which has a substantial Wikipedia entry - so I'll try not to repeat what is already covered there. It basically follows the traditional legends, as also covered by Bloch, but with some significant differences: 1) the magical elements are much more dramatised, in the way I had expected but been surprised not to find in Bloch's story, 2) there is a romance story, 3) the eventual destruction of the golem follows much more directly from its propensity to take instructions literally and go out of control and 4) the blood libel accusations are completely gone, with the Rabbi instead creating the golem to protect the Jewish community against an order from the Holy Roman Emperor that they must leave Prague. 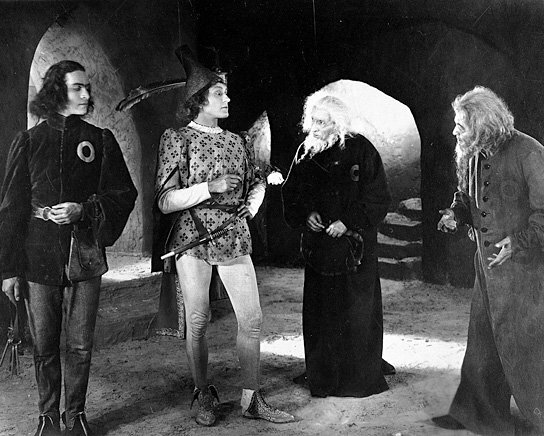 The sets, make-up and special effects are all spectacular, not just for their time but by any standards, while the film indulges in a little meta-referential connection between magic and the silver screen by having Rabbi Loew amaze the denizens of the Holy Roman Emperor's court with a light-show of figures from Jewish history. Watching it certainly made clear how iconic and influential the film has been, as I saw example after example of motifs and tropes I was familiar with from their later echoes in other films. Rabbi Loew's house and the magical rituals which he practises both strongly recall Rotwang in Metropolis (who I found particularly captivating last time I saw the film: LJ / DW), and indeed a documentary extra on the DVD pointed out that Metropolis also appeared to have borrowed the motif of levitating rings of fire from Rabbi Loew's creation of the golem for Rotwang's creation of the False Maria. 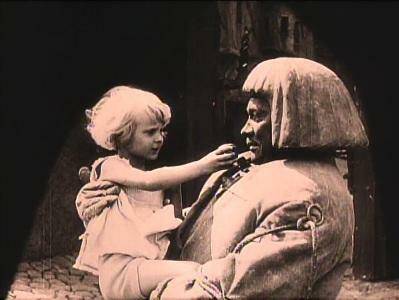 Another famous legacy is Universal's Frankenstein, whose creature appears to have been modelled at least partially after Wegener's golem's massive size and stiff-legged gait, and whose scene of the creature accepting flowers from a small girl beside a lake recalls a scene from this film of the golem accepting an apple from a child after it has been on a murderous rampage. Though Wegener himself later appeared in Nazi propaganda films, in this film we are broadly invited to identify and sympathise with the Jewish community. It even depicts them wearing circular badges on their clothes, exactly as has been repeatedly enforced in all sorts of historical contexts well before the Nazis came along, so does not shirk from representing them as Othered and oppressed. But the fact that this film directly depicts the golem as needing to be decommissioned because it has gone violently amok does also mean that it inevitably comes to stand for something frightening and threatening inherent in Judaism. Rabbi Loew thinks he can control the golem, but the actions of his jealous, disobedient assistant combined with the malign influence of a demon, Astaroth, mean that in practice he cannot. So ultimately the well-meaning actions of the Rabbi backfire, leaving hanging the implication that Jews may not mean to cause harm but nevertheless enable it. The emphasis is certainly different from the Jewish-perspective stories of Chayim Bloch, anyway. I'd be interested to know how it was received by audiences in Germany in its day. Here we enter an utterly different world from the two golem stories above. Meyrink's novel deliberately blurs the distinction between dreams and waking, illusion and reality, so that it's difficult to say at any point while reading it what is supposed to be 'real'. Despite the title, no straightforward golem ever appears, but its legend echoes around the walls of Prague's late 19th-century Jewish ghetto, where the story is set. On a certain level, the main character may 'be' the golem himself; on another it is a real being which appears to him; on another simply a metaphor for the strange, tragic, fantastical history of the ghetto and its community. There are realistic plot-lines about entrapment and murder, but also spiritual encounters and Kabbalistic visions. And there is a deep, almost psychogeographical, sense of the physical shape and character of the ghetto. Much of the novel is informed by Meyrink's personal experiences of living in Prague, recovering from a nervous breakdown and being imprisoned for fraud, as explained in the introduction to the edition I read, and also in this Guardian article. Perhaps for that reason, I think what has stayed with me most of all are his descriptions of the reality of life in late 19th-century Prague: the strange passageways and medieval buildings of the ghetto, the cabaret clubs, the cathedral, the apartment buildings. The ghetto itself was largely demolished while Meyrink was writing the novel, so that it is partly a eulogy for a lost world. I certainly found it haunting and intriguing, and am glad I was prompted to read it by our holiday: I'm sure I never would have done otherwise. Very different again, I'm pretty sure Pratchett's novels are where I first really encountered golems. They appear in many of his stories, but this is the one to which they are most central, and therefore to which I returned before our trip. In the light of my other pre-trip homework, I understood better what Pratchett was doing with his source material than I had last time I read this novel. As in the traditional stories, his golems work doggedly unless told to stop and can become dangerous under a malign influence. They also retain a Jewish verneer, in that they need to take a day off work periodically for religious reasons (i.e. a kind of Sabbath), and the font used to convey their communication (always written, because they cannot speak) is designed to look a bit like Hebrew lettering. But of course Pratchett does much more than simply recreate an established mythos: his golems are also essentially robots, in that the scrolls inside their heads not only animate them but act like a program, laying out the fundamental principles of how they should operate (to be supplemented by specific instructions from humans). As such, he uses them primarily to think about free will, agency, mechanisation and slavery, and, being Pratchett, does this very powerfully and poignantly without getting preachy. Meanwhile, Lord Vetinari is being poisoned, Angua and Carrot are negotiating their relationship, Vimes is struggling with his identity given his recent elevation to the aristocracy, Cheery Littlebottom is exploring gender issues within the basically well-meaning but very blokey environment of the Watch, and (in what to me was an unexpected and unremembered bonus) a very Dracula-esque vampire is manipulating everything from behind the scenes within the College of Heraldry. In other words, it's a very rich and elegantly-constructed novel with a helluva lot going on beyond the central thread of the golems. Definitely one that I am glad I had a prompt to re-read. I can also proudly report that I won a bat keyring by dint of coming first in the DracSoc holiday quiz, basically because I had done all the homework outlined here, and that is exactly what the quiz was about. Sometimes it pays to be a swot! 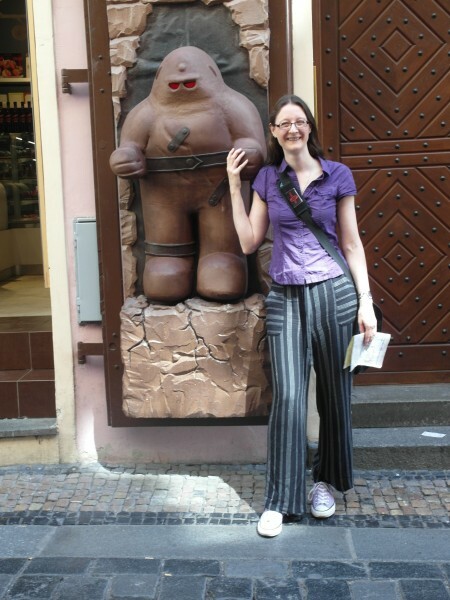 Pretty much all I know about golems comes from Feet of Clay, but that looks like a great trip. And congrats on winning the quiz! Feet of Clay is plenty, really! That said, if you want to get acquainted with the traditional legends, the 1920 film is a great way to do it for a mere 1.5 hours of your time, and very much worth watching in and of itself. I didn't see The Limehouse Golem, though you're right that I would almost certainly like it. I've had recommendtions for it from other friends whose taste I know I share. I will keep an eye out for it and catch it some time.